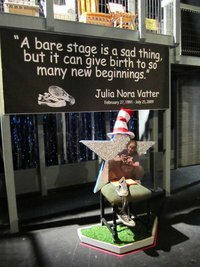 We request your theatre company’s participation in honoring our dear friend and Bay Street Theatre family member, Julia Vatter, by setting Julia’s Chair backstage during your production on Julia’s birthday, February 27, 2011. Julia’s Chairs were originally created to honor Julia Vatter and her behind the scenes dedication to the theatre. An accomplished stage manager at the age of 18 when she lost her life, the people closest to her at the Bay Street Players in Eustis, Florida. set a chair backstage to help cope with the loss. Julia’s Chair, in Julia Vatter’s honor, is a tribute to the individuals in theatre companies who have passed on but their spirit, their love for the arts and the love that those in theatre hold for them remains present as we journey on in our respective theatrical adventures. Julia Chairs have been set in productions ranging from school performances all the way to Broadway. Julia’s Chairs have been set in the Broadway touring productions of Wicked, Rent and Spring Awakening. Julia’s Chairs have been placed in the Broadway productions of Wicked and Next To Normal. We request that your theatre production be represented in this wonderful collection and we sincerely welcome your participation. Please ‘dress’ the chair with articles relevant to your show like a poster or prop. Take a photo of the chair (cast and crew are welcome in the photo). Please include the production, performance dates and who took the photo. Take a moment to view the impressive photos of “J.Chairs” that have been set in Julia’s honor in theatres around the U.S.A. Although the request above is made to haveJulia’s Chair” set on her birthday, 2/27/2011, please remember that Julia’s Chair can be set for any and every production now and for years to come. Your photos are welcome and will continue to be added to the group collection. Please feel free to invite other theatre companies around the world to participate in Julia’s Chairs. It’s a global invite for our intimate theatre community. This entry was posted in Community theater, In memoriam, Orlando theater and tagged bay street players, Community Theatre, eustis, julia vatter, Theatre. Bookmark the permalink. Nina and Bernie, I hope that this wonderful project of setting up chairs in Julia’s name eases some of your loss. I know it makes a lovely impression on those who experience it.